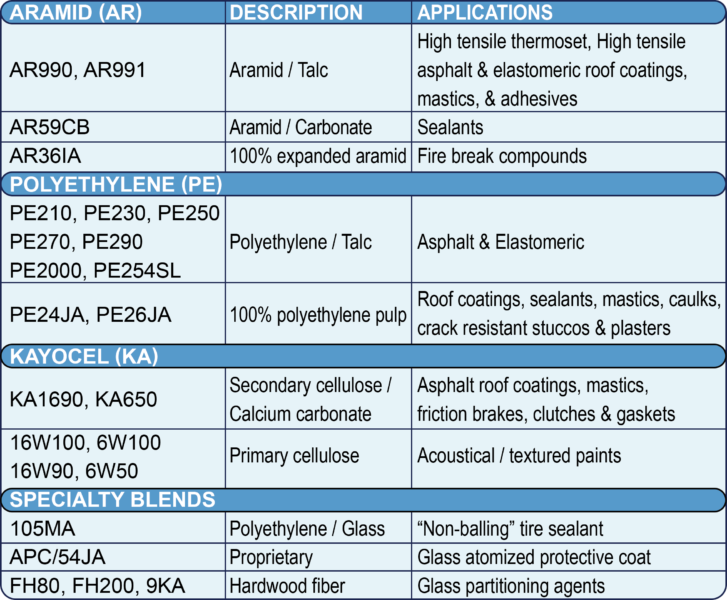 Natural, mineral and synthetic fibers such as KAYOCEL Celluloses, wood fibers, ceramic fibers, aramids, polyethylene (expanded), nylon and rayon are available for caulks, asphaltic roof coatings, mastics, adhesives, tire sealants, acoustical finishes, friction products (brakes & clutches), etc. The R.J. Marshall Company has a fiber for almost all applications in a wide range of fiber lengths and types. Aramid: Poly-para-phenylene terephthalamide. One of the strongest synthetic reinforcing fibers known. Expanded Aramid Pulp: An Aramid pulp that has been processed to impart greatest surface area thus maximizing physical properties and ease of dispersibility. Fiber Blends: A blend of two or more fibers or fibers and pulps. Fiber Compounds: A mixture of a pulp and non-fibrous functional or non-functional (filler) material. 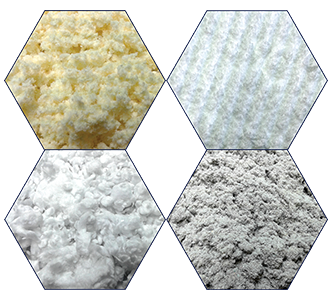 Polyethylene: (C2H4)n, a linear hydrocarbon, has a density of 0.91-0.96 g/cc, a melting point of 115-135oC, and is known for high chemical resistance and inertness. The pulp is highly fibrillated and an excellent reinforcing fiber. Primary Cellulose: A bleached and purified natural wood or cotton derived polysaccharide, having a density of 1.5g/cc, and used to manufacture of paper and food products. Cellulose have relatively high water and oil absorption. Cellulose decomposes at 260-270oC. Secondary Cellulose: A cellulose from reclaimed news and magazine stock.